﻿ Gulf South Forest Products, Inc. » Blog Archive Gulf South Forest Products: Keeping Blakeley Terminal Busy | Gulf South Forest Products, Inc. Anyone observing the Alabama State Port Authority’s Blakeley Terminal recently may not have been able to see the ground for the thousands of tons of poles covering the terminal’s 18 acres. 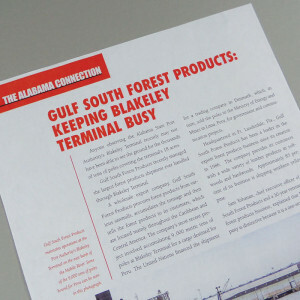 Gulf South Forest Products recently managed the largest forest products shipment ever handled through Blakeley Terminal. A wholesale export company, Gulf South Forest Products procures forest products from various sawmills, accumulates the tonnage and then sells the forest products to its customers, which are located mainly throughout the Caribbean and Central America. The company’s most recent project involved accumulating 9,000 metric tons of poles at Blakeley Terminal for a cargo destined for Peru. The United Nations financed the shipment for a trading company in Denmark, which, in turn, sold the poles to the Ministry of Energy and Mines in Lima, Peru, for government and communication projects. Headquartered in Ft. Lauderdale, Fla., Gulf South Forest Products has been a leader in the export forest products business since its creation in 1986. The company provides its customers with a wide variety of lumber products in softwoods and hardwoods. Approximately 85 percent of its business is shipping southern yellow pine. Sam Yohanan, chief executive officer of Gulf South Forest Products and a 30-year veteran of the forest products business, explained that his company is distinctive because it is a one-stop shop for forest products export. “‘We are unique in the sense that we procure and accumulate forest products, charter our own vessels and export the forest products to customers on a timely basis,” he said. Gulf South represents one of the Authority’s top six largest forest products shippers in import and export volumes.With only 13 employees, the company exports 60,000 -120,000 tons per year from the United States to foreign countries. “The largest export areas are Jamaica and Haiti, as well as the Dominican Republic, which is the largest importer of southern yellow pine using it for construction purposes,” Yohanan said. Yohanan noted 80 percent of the forest products the company procures is from Alabama sawmills. The majority of poles for the Peru shipment were supplied by Swift Lumber Co. in Atmore. The company initially housed its operations at the Alabama State Port Authority’s Pier North A and later moved to Blakeley Terminal, where it has been for the past nine years as the exclusive tenant. Yohanan said being at Blakeley Terminal has enhanced the company’s operations as it is situated on 18 acres of land and has a 153,000-squarefoot warehouse. He added that the 1,400 feet of water frontage and the ability to accommodate vessels up to 1,000 feet in length with docking area right on the Mobile River makes it especially easy for vessels to arrive and depart at the terminal.